Generally the sap starts to flow between mid-February and mid-March. The exact time of year depends upon where you live and weather conditions. Sap flows when daytime temperatures rise above freezing (32 degrees Fahrenheit / 0 Celsius) and nighttime temperatures fall below freezing. The rising temperature creates pressure in the tree generating the sap flow. This is basically a transfer of the sap from the tree above the ground and the root system below the ground. The sap generally flows for 4 to 6 weeks, with the best sap produced early on in the sap-flowing season. Clean spiles bucket, and lids prior to use each season. With a mixture of 1 part unscented household bleach (such as Clorox® Regular-Bleach) to 20 parts clean water, use a brush or cloth to scrub your supplies. Triple rinse all with hot water. Now the excitement starts. The weather conditions are ideal and you are headed out to the yard to tap your first tree. Take your drill (with bit attached), hammer, spiles, hooks, buckets, and lids. Don’t forget your camera to capture the moment. The height of the tap hole should be at a height that is convenient for you and allows easy collection. A height of about 3 feet is recommended. If the tree has been tapped in previous seasons, do not tap within 6 inches of the former tap hole. Ideally, the tap hole should be above a large root or below a large branch on the south side of the tree. 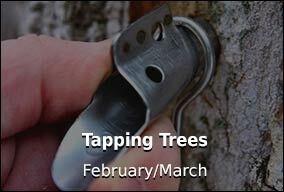 If more than one tap is to be placed in the same tree, distribute the tap holes around the circumference of the tree. Be sure to avoid any damaged area of the tree. The size of the drill bit to be used is dependent on the type of spile you are using. Most spiles require either a 7/16 or 5/16 bit. Drill a hole 2 to 2 ½ inches deep. It may be helpful to wrap a piece of tape around the drill bit 2 ½ inches from the tip to use as a guide. 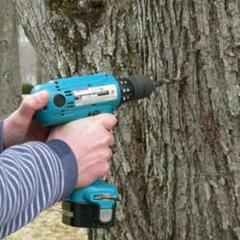 Drill at a slight upward angle to facilitate downward flow of sap from the hole. The shavings from the drilled tap hole should be light brown, indicating healthy sapwood. If the shavings are dark brown, drill another hole in a different location. Clear any wood shavings from the edge of the hole. Insert the spile into the loop on the hook (hook facing outward), and then insert the spile into the tap hole. Gently tap the spile into the tree with a hammer (do not pound the spile into the tree, as this may cause the wood to split). 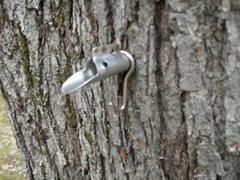 If the sap is flowing, you should immediately see sap dripping from the spile. Hang the bucket by inserting the hook into the hole on the rim of the bucket. Attach the lid to the spile by inserting the metal wire into the double holes on the spile. Congratulations, you have successfully tapped your first maple tree. Send us a picture!